The expanded Reemployment Services and Eligibility Assessment (RESEA) program offers states a prime opportunity to drive important program innovation before the next recession. The opportunity can be seen much more clearly now that our economy is strong. For example, despite a 3.9% unemployment rate in August and more jobs than job seekers in our economy, over a third of the past year’s UI claimants exhausted all of their benefits without landing a job. [ii] This is not unique to our post-recession economy—it was also true in our last boom economy, before the great recession. Sadly, these UI exhaustees tend to add to the 1.3 million people stuck in long-term unemployment. Those who are stuck long enough are also prone to joining the 37% of working-age people who’ve dropped out or not entered the workforce. As a partial result, the U.S. hasn’t seen workforce participation rates this low in since 1977. Significantly, the new RESEA program has a promising focus on what works and could drive real improvements. A central feature requires funded reemployment interventions be backed by evidence they will get people back to work and shorten UI claims. The level of evidence required of states grows over time, as funding approaches three quarters of a billion dollars per year. Some of the key research has been compiled at DOL’s Clearinghouse webpages where each study has been scored by its level of causal evidence. [viii] Other research compilations also offer important insights for states. For example, one meta-analysis synthesized findings from 47 separate studies and concluded that job seekers improve their likelihood of landing by over 60% by incorporating strategies such as increasing proactivity (e.g., creating a job search plan) and improving job search efficacy and skills. [ix] There are also well-researched studies of reemployment interventions in other large-scale public programs, such as the Temporary Assistance to Needy Families, that offer useful evidence. As we increase our focus on the evidence of what actually works, it’s important to also focus on the proof of what happened. 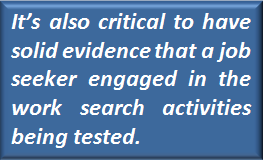 In other words, it’s also critical to have solid evidence that a job seeker engaged in the work search activities being tested. Here we have a challenge that has existed since the UI program began in 1935. Current work search requirements in most states are largely devoid of dependable proof that claimants have engaged in a work search activity. For example, the common requirement that claimants contact a certain number of employers each week is inherently difficult to verify. Fortunately, states have been expanding the use of work search activities that are fully verifiable, e.g. work registrations, online workshops, in person meetings and other evidence-rich strategies. States embracing this trend in work search verifiability will also improve their performance in UI integrity by tackling one of its biggest drivers—work search integrity. Though the coming wave of grand experiments holds great promise, states have faced some hurdles in the past: A number of proven strategies have been impeded by federal regulation. For example, work-based training in the form of volunteerism has been recognized by the federal government’s Corporation for National and Community Service as one of the best strategies for landing a new job, improving the chances of being hired by 27%. [x] This is largely because volunteer work gives job seekers experience, a foot in the door and a new network. Unfortunately, while the federal government has encouraged volunteerism in the nonprofit and government sectors, DOL regulations essentially outlaw it for over two thirds of all jobs by prohibiting even short-term internships offered by for-profit employers interested in giving under-qualified job seekers a chance. [xi] Regulations also chilled the expansion of wage subsidy programs that can be critical reemployment strategies for claimants who have a skills or experience gap preventing them from landing a job. [xii] Such regulations may be ripe for updates before the next recession. To do so requires analysis of both our experience from the last recession and our opportunities to maintain worker protections while expanding meaningful assistance to unemployed workers. It will also be important to establish insightful measures connected with RESEA. 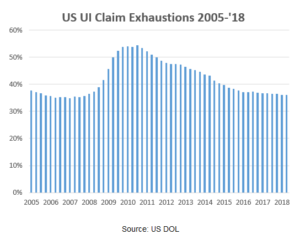 The new RESEA program focuses on UI claim duration, but what about the one-third of all claimants who exhaust their UI claims and fall deep into the mire of long-term unemployment? Because many remain unemployed long after the typical six-month claim eligibility period, unemployment spell reductions beyond the sixth month won’t be captured by the claim duration measure. Since it is highly related to UI claim duration, one additional measure states should track is the impact reemployment strategies have on claimant exhaustion rates. Should All Results Be Considered Equally Worthy? DOL is charged with defining what low-, moderate- and high- mean as they relate to causal evidence of reducing duration of a UI claim. If DOL follows the evidence-based approach in other programs, e.g. the home-based visits program in child welfare, it will group studies based on the strength of the study methodology. While focusing on study methods is important, equally imperative may be reemployment results. Without a results focus, we may end up with programs that are high in evidence, but low in impact. To this end, in addition to scoring programs by their level of evidence, DOL could require state plans to include data related to program reemployment impact. Perhaps programs should also be categorized as low, moderate and high based on their impact. Such impacts could be easily quantified by their reduction in UI claim duration – a stated goal for RESEA. For example, Nevada’s REA program drove a three-week drop in claim duration, an impact that might be defined as moderate or high. A related area for DOL and states to consider is return on investment. Should all programs that yield results be considered equal, regardless of the cost? Forward-looking states may be wise to measure the cost required to achieve results. 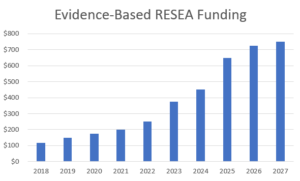 Evidencing a strong return on investment may be important in future years to avoid undue scrutiny by congressional appropriators asking if the new RESEA funds are being spent wisely. For example, Nevada’s REA program gained national attention and was well-received in Congress for both its outcomes and its ROI. Nevada achieved a per-capita savings of $800 at a cost of just $211, yielding an ROI of nearly 400%. By getting more bang for the buck with a strong ROI, states can help ensure more struggling UI claimants get the help they need. As we gear up for the next recession, we’re fortunate to have a renewed focus on what works for the unemployed. A committed Congress has laid generous groundwork that DOL can use to plant a new crop of promising reemployment insurance programs. How prepared we’ll be will depend largely on how states respond to the challenges and opportunities before them. John Courtney is President of the American Institute for Full Employment, whose team of consultants has worked with 25 states and Congress to develop evidence-based reemployment solutions in unemployment insurance, welfare and workforce programs for the past 25 years. For help with your state’s evidence-based RESEA program, contact the Institute at bills@fullemployment.org or visit www.fullemployment.org. [i] Subject to the annual Congressional appropriations process. [ii] US Department of Labor Employment and Training 12 months ending 06/30/2018 exhaustion rate of 35.98% https://ows.doleta.gov/unemploy/DataDashboard.asp. [iii] In Utah, claimants participating in online registration have hire rates that are 26% higher than those who do not complete the process State Innovation: Re-employment Focus in the Unemployment Insurance Program, Michelle Beebe, US House of Representatives, Committee on Ways and Means, Subcommittee on Human Resources, September 7, 2016, Hearing on Challenges and Strengths of Today’s Unemployment Insurance System. [iv] At a 12-months, 87 percent of the treatment group had landed jobs compared to 59 percent in the control group. N.H Azrin, R.A. Philip, P Thienes-Hontos, V.A. Besalel. 1980. “Comparative Evaluation of the Job Club Program for Welfare Recipients.” Journal of Vocational Behavior 16(2) 133-145 (April). [v] Michaelides, M., Poe-Yamagata, E., Benus, J., & Tirumalasetti, D. (2012). 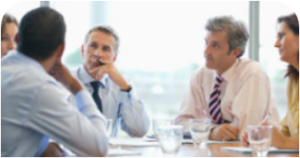 Impact of the Reemployment and Eligibility Assessment (REA) Initiative in Nevada. Columbia, MD: IMPAQ International, LLC. [vi] Moderate causal studies of Oregon’s UI JOBS Plus program also showed a 15% increase in wages and a 17.2% gain in employment retention at 12-months. Oregon Employment Department. [vii] Using regression analysis while controlling for demographic and economic factors, the Texas Workforce Commission studied its DOL award-winning Back to Work program and found that UI claimants reduced claims by 9 weeks on average. [viii] US DOL’s clearinghouse for labor evaluation and research is online at https://clear.dol.gov/topic-area/reemployment. [x] Volunteering as a Pathway to Employment, The Corporation for National and Community Service (CNCS), June 2013. [xi] The Georgia Works program allowed UI claimants to continue to claim UI benefits while gaining experience and training by volunteering with employers for up to eight weeks, but largely disappeared after DOL regulations suggested that any program providing a net benefit to an employer would require employers to pay wages to trainees. [xii] Shortly after Texas won DOL’s innovation award, Congress passed a bipartisan bill allowing up to 10 states to develop similar demonstration programs. But after US DOL issued a lengthy set of regulations on program design, the dozen or so states ready to participate gave up their aspirations to enact their own programs.